Barnes Engineering Company builds chassis drawer slides for numerous commercial, industrial, military, and medical slide applications. 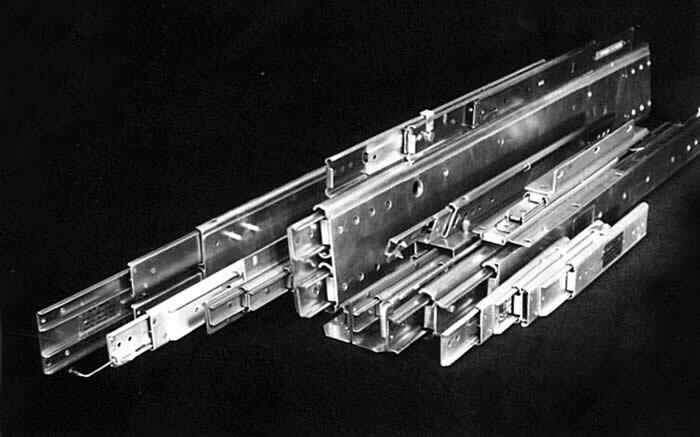 Our Slim-Track product line includes custom drawer slides, linear slides, drawer rails, electronic rack slides, EIA slides, slide rails, ball bearing slides, solid bearing slides, computer tracks. This site is intended to be only a Basic Guide to the Slide cross Sections for which Barnes Engineering is fully tooled. Other Configurations for heavier loads and Special Requirements are under Study. If you do not see the Slide or Slide Options that you desire, please consult us. It has been our experience that almost all Successful Applications involve integrating the Sliding Mechanism with the Mating Structure. This may involve Bracketry, tolerance absorbing Spring Tabs, Lift Off rails for removing the Package, or other Mechanical Devices. Whatever the Detail, we need the Co-operation and Input Information from the Design Engineer to insure that the job is well done.Barnes Engineering maintains a Test Facility and Prototype Department for Evaluation of all Applicaitons. These services are available at a nominal cost or free of charge depending on the Potential of the Application. For prompt attention to your Linear Mechanism problems, please send us your Prints or preferably a Sample Unit for a full-in-depth analysis at no cost to your Company. It is only through your cooperation that we can advance the State of the Art and maintain our avowed Company Goals of originality and Service to the Customer. Here is a money making thought! On your orders of 500 pair slides, 1000 pair and up, we will definitely save you money if you order from us in the USA, and will give you 2 to 3 weeks on orders shipped to a US destination! Also, we are set-up to take your small orders, you know, 5,10,20,50 and 100 pair orders, and also unlimited quantities. As we are the original inventors of precision ball bearing slides (47 years) and are uniquely qualified to supply all of your precision linear motion requirements. We have invented and are the only manufacturers of real Heavy-Duty Precision Ball Bearing Slides with real experience manufacturing slides up to 30 feet long to carry loads of 500 lbs., 1000 lbs., 3000 lbs., 5000 lbs., 10,000 lbs and up, along with slides to carry 50 lbs., 100 lbs., 200 lbs., etc. All of our slides are manufactures from cold rolled steel, aluminum or stainless steel.